Matt Dyer of Turner recalls the terrifying moments in July when a polar bear carried him away in its jaws. TURNER – Matt Dyer was hanging from the mouth of a polar bear that had just plucked him by the head from his tent as he heard the sound of his neck bones breaking under the crushing pressure of massive jaws. He did not struggle, but was carried away motionless and helpless like a kitten in the mouth of its mother. As he stared down at the bear’s belly and huge legs marching away from camp, he saw a light — the light of a flare fired by a member of his hiking party. The startled bear dropped him, and Dyer lay perfectly still. The thousand-pound bear didn’t utter a sound, but Dyer could hear its footsteps around him, and then receding. Dyer is one of the few people in the world to have been attacked by a polar bear and survived — albeit with two cracked vertebrae, a broken jaw, a collapsed lung, injuries to both hands and a gash on the forehead. He faces a lengthy and painful recovery, although he hopes this week to get his neck brace removed. Interviewed at his home last week, Dyer said he is lucky to be alive, and able to walk and shake hands and make jokes. Dyer, 48, is a native of Cliff Island in Casco Bay, where he spent his early youth and still has family. A liberal activist since he was a young man, he determined the law was a better way to help people than his earlier jobs working in retail or light industry. He now serves as a staff attorney for Pine Tree Legal Assistance helping protect the civil rights of poor people. Four years ago, Dyer and his wife, photographer Jeanne Wells, moved from Portland to the rural town of Turner to be closer to nature — and so he could have a shorter commute to his office in Lewiston. The home they share is near Androscoggin Riverlands State Park and the Androscoggin River. Last year, Dyer was flipping through a copy of Sierra Club magazine — he’s a longtime member of the environmental group — and saw an ad for a trip to Torngat Mountains National Park in northern Labrador, billed in the ad as a land of spirits and polar bears. Dyer figured he could afford the $6,000 cost for a once-in-a-lifetime experience. His only other major trip was when he traveled in Europe while in college. His main concern about the two-week hiking excursion to Labrador was meeting the physical demands of the trip. He started training, hiking or snowshoeing 10 miles with filled water bottles in his backpack for weight. As he prepared to leave Maine in July, he joked with a colleague that he would be back unless a polar bear gets him. When he and the other six in the hiking party assembled in Quebec, he was among the fittest. Torngat Mountains National Park is Canada’s youngest national park, created in 2005. The local Inuit agreed to allow the area to become a park but under the stipulation that only the native people could carry firearms in it. The park is home to an abundance of wildlife, including omnivorous black bears and, during the brief summer months, the strictly meat-eating polar bears. Bad weather delayed for several days the group’s foray into the park. Eventually, they were flown in by float plane, crossing desolate mountains of rock and ice and landing in the spectacular Nachvak Fjord. Like the others, Dyer was amazed. Herds of caribou grazed the tundra and wolves ran in the distance, giving the hikers a wide berth. Minke whales splashed in the deep waters of the fjord. Wildflowers and scrub willows sprang from hardscrabble ground. There were signs, too, of nature’s darker side. The ground was strewn with bones. The subarctic climate apparently preserves the bones of dead animals, Dyer said. They found bleached wolf skulls, whale bones and caribou. Dyer found the leg of a wolf that still had tissue on it, all that remained of a recent kill. The park weather would change swiftly. A brisk east wind replaced sun and temperatures in the 60s with rain verging on sleet and temperatures in the 40s. The group set up camp near the fjord, tents clustered in a space Dyer described as the size of his modest living room. At the edge of a three-foot buffer, they were encircled by the thin wire of an electrified bear fence. The high-voltage device had always been adequate to protect hikers from a bear attack. “I was never fully on board with the fence anyway,” Dyer said. “It was pretty flimsy looking.” He would have favored having someone sit up all night keeping watch. Dyer was aware of the threat of polar bears. He had read up on them extensively. He thought if he was lucky, they might see one. Since it opened, the park had never had a polar bear attack a human, although some groups hire Inuit bear guards, armed with rifles. Dyer does not believe a guard would have made a difference, unless the guard kept watch all night and didn’t sleep. That first morning, the group woke to the sight of a polar bear cub, soon joined by its mother, perhaps 100 yards away. “I thought, ‘Oh, God, this is great,” Dyer said. The next day, after returning from a hike inland to scout the location for the next campsite, they spotted a male polar bear, much larger than the one the day before. He eyed them and ambled closer, his tongue lolling. The group gathered together and started to make noise as they had been instructed. The bears are less likely to attack a group than one or two people alone, Dyer said..
“He was getting closer … a little too close,” he said. The bear was probably 30 to 50 yards away. One of the trip leaders fired a flare gun and the bear ambled off, climbing onto a ledge where it watched their camp, sometimes dozing. The group had dinner and retreated into their tents before sundown. That far north, the summer sun sets at 11 p.m. and rises at 3 a.m. It was in the brief twilight between the two that the bear struck on July 24. Dyer said he is a light sleeper and for whatever reason, was lying awake on his back staring at the ceiling of the tent. His tent was on the western side of the grouping and he suspects the bear approached from downwind. His was the first tent it came to. “I’m laying awake. I saw the shadow of these two bear arms coming over the top and I thought, ‘Oh, boy.’ … There was no doubt what it was,” he said. Dyer was being lifted by his head, the shroud of the tent still around him. The bear didn’t growl or roar. The beast’s mouth enveloped the back of his neck. The jaws were so close to his ear he heard his bones breaking. “I couldn’t see his head. He had me by the back of the neck” and he was moving quickly away from camp. “I didn’t scream. I wasn’t panicking. I was just keeping still, waiting for it to happen,” Dyer said. At one point, as the camp erupted into noisy chaos, the bear whipped him around, maybe to look back. One of the hikers had fired a flare that hung in the sky, burning intensely. The bear dropped him. Dyer lay like an animal playing dead. The bear retreated and members of the group nervously approached where Dyer lay. He couldn’t speak, and in the dim light they feared what they would find. Dyer is convinced he would have died if not for one of the group being a doctor. Rick Isenberg, a research physician from Arizona, got Dyer into a tent and set about stabilizing his broken bones and treating multiple puncture wounds. It was 1:30 a.m. One of Isenberg’s first tasks, as he worked to treat the back of Dyer’s neck, was to cut through Dyer’s formidable ponytail with the first aid kit’s small pair of scissors, he said. Somewhere, he chuckled, his ponytail is now lying among the bones on the rugged landscape. Another in the group tried to raise help on the ship-to-shore radio but was unable to get any response. Dyer lay for hours in the small tent, the other hikers taking turns sitting with him. Others kept a nervous watch in case the bear came back. The bear’s smell and saliva enveloped him. “It was like slug slime. Then you get the smell, very fishy, oily, and it lingered for a week,” he said. Despite his injuries, he said he felt good. Finally, at 6:30 that morning, they were able to reach a Royal Canadian Mounted Police communications center. The park service dispatched a rescue helicopter, which took an hour to reach them. Seven hours after the bear attacked him, Dyer was loaded into the helicopter. Isenberg stayed with him. The park service left behind a bear guard armed with a rifle to stay with the other hikers, who waited 12 more hours until a boat arrived to evacuate them. 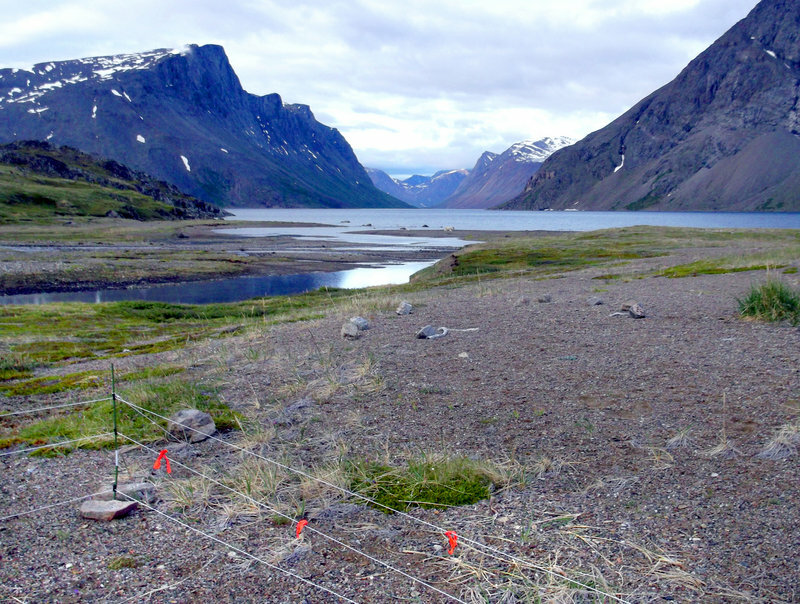 Dyer remembers flying into the Torngat park base camp, which reminded him of a lumber camp. Impending bad weather convinced the park service he should be flown to Kangiqsualujjuaq, a small town in northern Quebec, and then on to Montreal. Dyer said he wasn’t in a lot of pain. At the hospital in northern Quebec, he remembers a flurry of activity. They needed to install a breathing tube and he was given anesthesia. He was placed in a medically induced coma for the trip. He woke at Montreal General Hospital, 1,000 miles to the south. Back in Maine, Wells had been working with her photography equipment, shuttling between her house and her adjacent studio, when she saw two missed calls from Canada on her cellphone. “I knew it was bad. I didn’t want to call back,” she said. The phone rang. It was Isenberg. “He said, ‘A polar bear attacked Matt but he’s OK,”‘ she recalled. She grabbed the next flight to Montreal, arriving about the same time as her husband. He was breathing through a tube and his head was strapped to two yellow blocks to keep it immobile. He was covered in wounds. The doctors started slowly bringing him out of his coma. When he saw her, he burst into tears. His wife said the bear smell stayed with him for days, filling the room even as he lay in the intensive care unit at Montreal General Hospital. 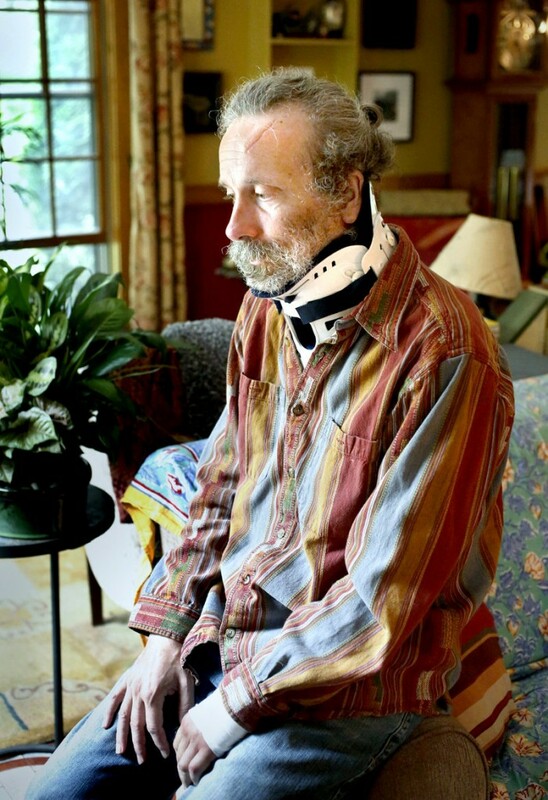 Dyer had suffered fractures in his first and second cervical vertebrae, but no damage to his spinal column. His jaw was broken and remains extremely painful, although he has graduated from eating only yogurt to other soft foods, such as mashed potatoes and tuna fish. He has dropped 30 pounds in the month since the attack. It will take six to nine months for his jaw to heal completely. He has trouble moving the pinky finger on his right hand because of tendon damage where the bear’s teeth penetrated. The cast was taken off his left hand, as were the metal pins to stabilize it, but it remains wrapped in gauze. The pinky and the thumb were broken. His carotid artery was partially blocked from where the bear’s tooth nicked it. “A half inch either way, he would have bled out,” Wells said. As it is, several doctors were surprised he didn’t suffer a stroke as a result of the arterial wound. Dyer sports a Harry Potter-like scar on his forehead, but like many of his other cuts and bite marks, it has healed much in the past month. For all that, he’s upbeat and able to find the humor amidst the ordeal. Investigators still don’t know what went wrong. The bear fence was too mangled to determine whether it had malfunctioned or the bear had just pushed through the pain, intent on its next meal. Dyer has no plans to bring legal action. He does not blame the park or the Sierra Club. He also does not blame the bear. “I’m glad that bear got away and didn’t get shot. I’d have felt terrible if that bear got killed because I was there,” Dyer said.